Owning a commercial property means that you are probably in charge of a business, even if that business is owning and operating that property itself. 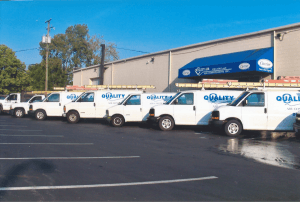 Whatever type of business you may be in, though, remember that it is absolutely necessary that you schedule your commercial HVAC services with skilled, trained professionals. Whatever it is that your property is used for, those living, dining, shopping, or working within that property rightfully expect to do so in a certain level of comfort. If you are looking for a new commercial comfort system, we strongly recommend that you give a rooftop unit in Columbus, OH some serious consideration. Why Choose a Rooftop Unit? There are a few reasons why you may want to choose a rooftop unit for heating and cooling your commercial property. One of the greatest benefits that a rooftop unit offers is accessibility for your HVAC technicians. These systems house the majority of the heating and cooling equipment required to keep your commercial property comfortable throughout the year (assuming that you are using a packaged unit). When you encounter a problem with your system, or if you just need routine maintenance, your technician can just make his or her way up to the roof, and everything can be accessed right there. You won’t have to have technicians setting up shop within the property itself. Rooftop units are also helpful in maintaining an aesthetically pleasing property. HVAC equipment is a necessity, of course, but it is also rather visually unappealing. It also makes a fair amount of noise as it works to both heat and cool your property. By keeping your unit up on the roof, you won’t have to worry about its appearance and the impression that it makes on potential customers. Finally, using a rooftop unit is simply a great way in which to save space on your property. You can free up some space for additional parking, landscaping, or outdoor seating by moving this equipment up to the roof. Just remember that you need to hire trained professionals to get that equipment up there, and to service your unit. Call Quality Air Heating and Air Conditioning if you think that a rooftop unit is right for you.